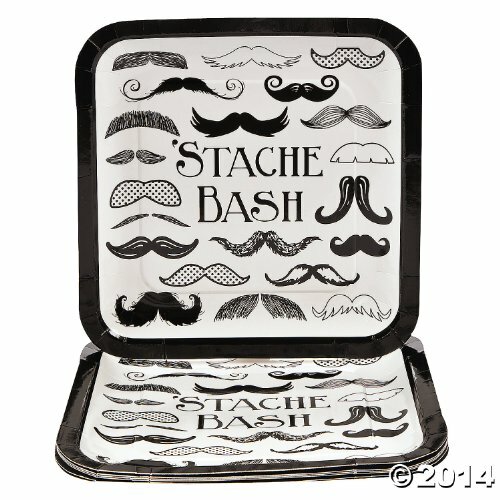 Celebrate your next bash with this dashing mustache theme party tableware bundle! 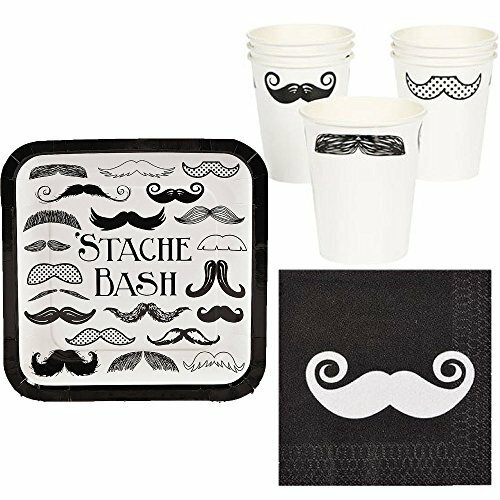 MUSTACHE MAN PARTY DECOR - No mustache party, birthday or baby shower is complete without this party ware supplies bundle. All the tableware decorations you need to enhance your theme. Great for kids and adults. 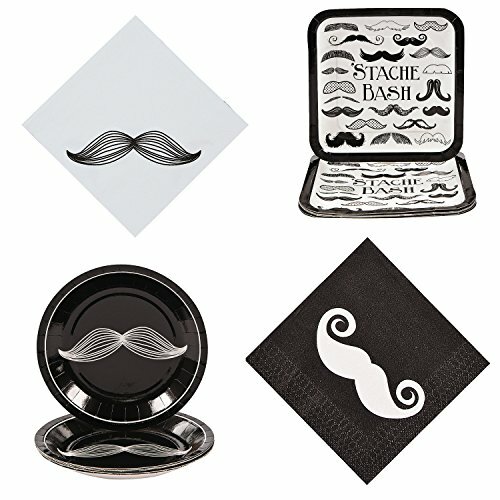 TABLEWARE SET - The perfect lunch and dinnerware set adorned with different style and sizes of manly mustaches. Perfect to welcome your guests and for decorating your big event. Each Bundle Includes: 8 Dinner Plates. Size: 9" 8 Dessert Plates, Size: 7" 16 Luncheon Napkins. Size: 6.5" 16 Beverage Napkins. 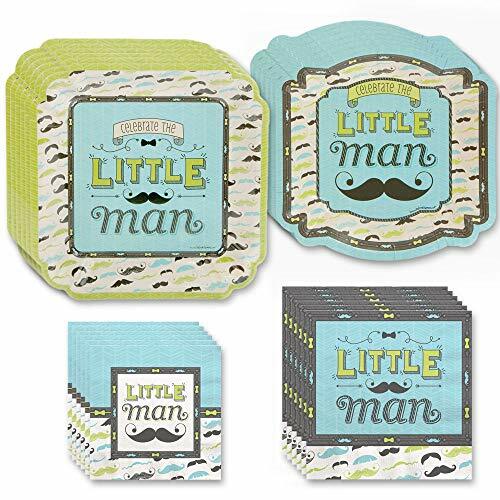 Size: 5"
32 Person Dashing Little Man Mustache Party Tableware Bundles are perfect for baby showers, birthday parties and more! You'll receive all the tableware you need in one kit: 32 dinner plates, 32 dessert plates, 32 luncheon napkins, 32 beverage napkins. Includes (8) Mustache Man paper dinner plates. 16 Dashing Little Man Mustache Party - Tableware Bundles are perfect for baby showers, birthday parties, bridal showers and more! You'll receive all the tableware you need in one kit: 16 dinner plates, 16 dessert plates, 16 luncheon napkins, 16 beverage napkins. 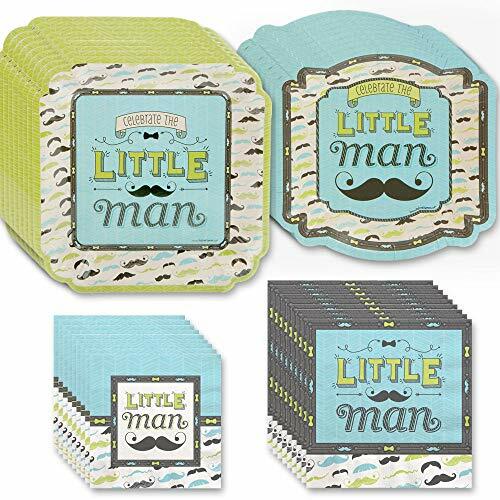 Mustache Man Party Pack for 24 includes: 24 Mustache Man Dinner Plates, 24 Mustache Man Dessert Plates, 24 Mustache Man Paper Cups, 60 Mustache Man Lunch Napkins, 24 Forks & Spoons, and 1 Plastic Tablecover. 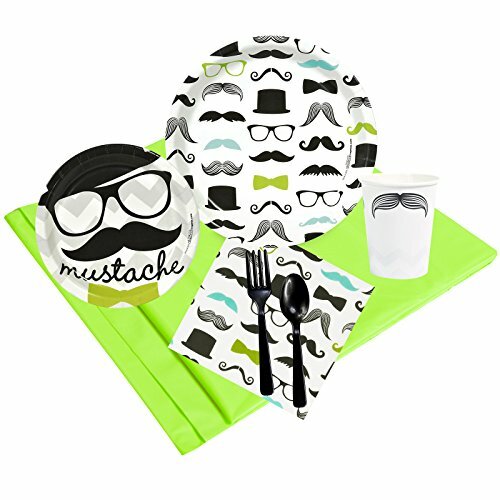 Mustache Man 24 Guest Party Pack includes 24 dinner plates, dessert plates, cups, forks, spoons, 40 lunch napkins, 2 solid table clothes. Low on fuss, high on style, these vibrant, disposable Square Dinner Plates make it a pleasure to entertain guests. A classic staple for casual dining, keep a stash of these nine-inch Square Solid Dinner Plates handy for special occasions and last minute get-togethers. With seven colors to choose from, you're sure to find something to match your party style. These Square Plates come in hot pink, yellow, red, royal blue, lime green, orange or black. Square Paper Dinner Plates are sold in a package of 14 and measure nine inches across. Mix the Square Dinner Plates with other solid color party supplies and decorations to create a unique party atmosphere. 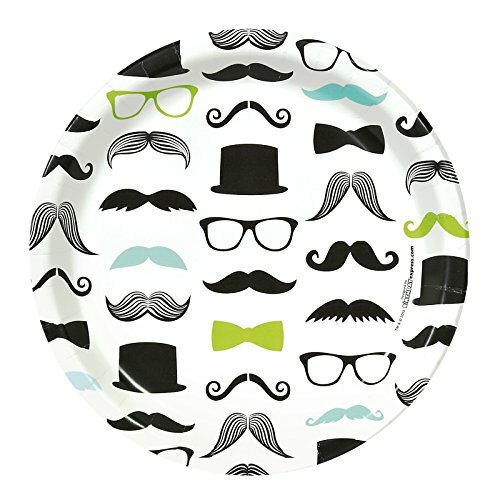 Our newest modern shaped plate and a perfect little man color scheme, these adorable Dashing Little Man Mustache Party dinner plates are large enough to handle the main course and delight your guests! They will love the little mustache pattern.Take and put on your party table for decorations, tape them to bottles or glasses to give them extra bling.Punch holes in them and string them with ribbon for a garland banner or for a back drop for pictures. Jazz up your party fare with these stylish Gold Paper Dessert Plates. With a glam gold color, these paper plates will make an excellent addition to a birthday party or special event. Use these disposable plates to pass out appetizers and other tasty finger foods, or simply stack them on your snack table for guests to grab and load up with their favorite foods themselves. Make your entire celebration stand out with more glitzy gold party supplies. Serve delicious treats in style for your gender reveal themed party with the Gender Reveal Square Plates. These plates feature easy-to-hold, rounded edges, an adorable baby blue and pink design with white lettering and accents and are disposable making cleanup a breeze. Coordinate these Gender Reveal Square Dinner Plates with other Gender Reveal supplies and decorations to make your announcement a success. Gender Reveal Paper Plates come eight to a pack. Get set to serve a meal with the help of our Red Paper Plates. These 9-inch party plates conveniently come 20 in a pack, so you'll be well prepared for your birthday party or other celebration. Each of these red plates are made with extra-strong paper, so guests can use them to hold big helpings. Then, after everyone's finished eating, these disposable plates make cleanup fast and easy. Shop the rest of our red party supplies to get ready for your special event. A simple craft project to make mustaches and add them to mini beanie animals to make them great!